My kitchen backsplash, and, well, my kitchen in general really, have been bugging me a bit since forever. Today we’ll just talk about the back splash though. 🙂 There wasn’t one. Well, there was a wall there, but it was just plain painted wall, the same chalky white as the rest of the room. You know what? The kitchen overall is not entirely unpleasant. I know this, but for some reason, the eye just seems to want a focal point on the backsplash. Something to draw it in and make things a little more interesting. The eye wants what it wants! I could go ahead and put some tile up. That would really help things. And I even love tiling! The problem is that I’d like to rip that counter top out sooner rather than later, and that would damage my tile work, so I’ll just have to wait and see what I can do to make the space a little cozier in the meantime. So here’s how things are looking in the kitchen now! Wow! What a difference, right? The whole area suddenly seems so much more finished and complete. The eye is happy! All I did was paint out the backsplash area with a little bit of paint left in the bottom of a sample pot (and clearly I didn’t even do too detailed of a job) and the difference it makes in the feel of the kitchen is tremendous. It’s one of those things that just brings out everything else around it. In fact, one of my mother-in-laws was here the other day and she just now noticed things like the new lighting and the cornices that have been up since February. Suddenly it looked like I had done a whole ton of work in there, but really all I did was take about an hour of my time one evening and slop a little paint on there. It even make the area around my super old range look a little more current. I used the concept of color blocking here and just painted on a solid block of color that isn’t found anywhere else in the room. That really just makes it a pop of the dark gray color rather than a continuation of something else from the room, and gives it that “backsplash” feel, since “real” backsplashes usually use a material that isn’t used anywhere else in the room. Even though this color is a neutral (Martha Stewart Crevecoeur), it’s still a bold color and really makes a statement and draws the eye in.Wimpy colors just can’t do the heavy lifting, decor-wise, that’s needed to make up for the lack of a real solid tile or stone backsplash. 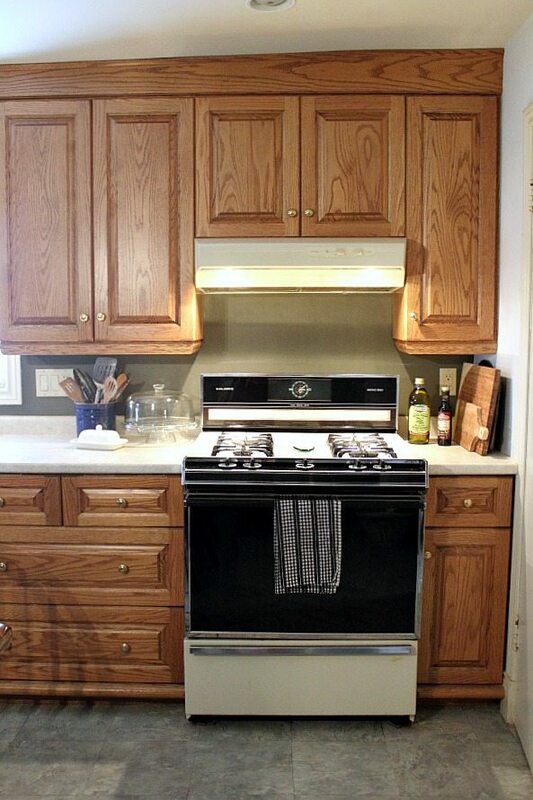 Contrast: If I would have picked a color too similar to the cabinetry or the counter, the effect would be lost. 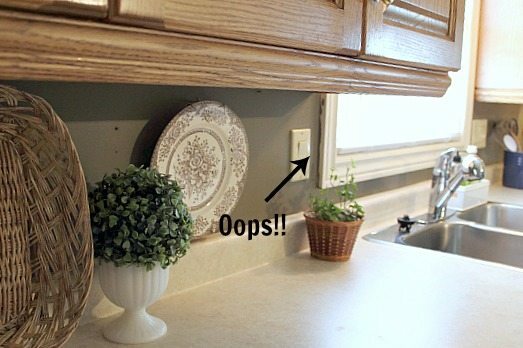 So that’s how you can do something really simple like painting a tiny strip of wall, and get away with calling it a backsplash. 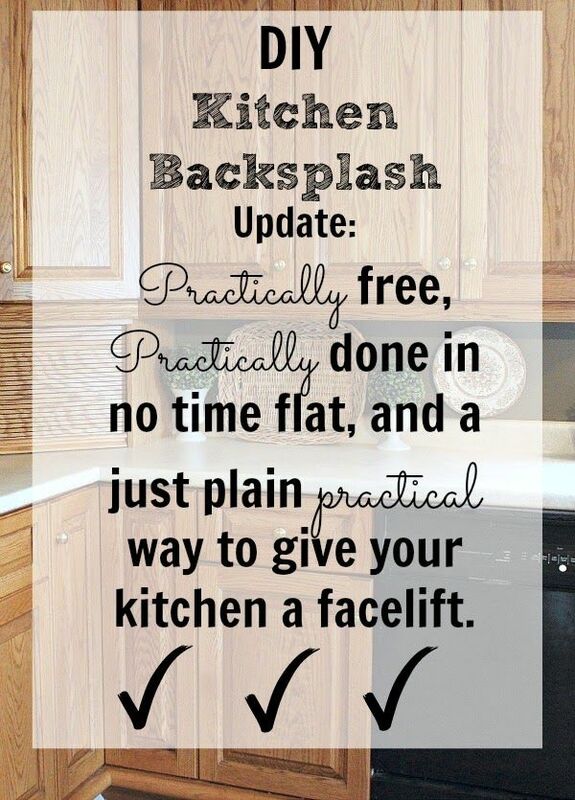 If you don’t have anything on your backsplash, give this quick fix a try. You’ll be surprised at how much more you love the space afterwards! Linking up to Traci’s best DIY projects of August Party! Looks great! What a great idea and that color is perfect! 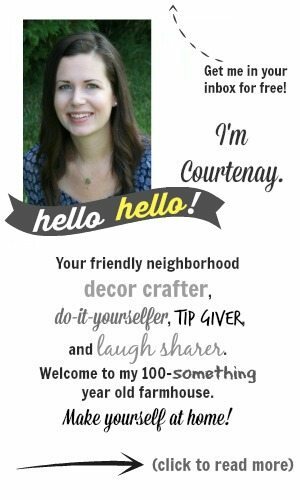 Great idea Courtenay! I love this. Now you’ve got me thinking of a temp solution until I finish my kitchen!!! Oh yes! It does look better – some eye candy for sure! I love the colour you chose Courtenay. It really pops and makes the decor stand out. A great idea until you can tile and replace your countertop. What a fantastic idea! 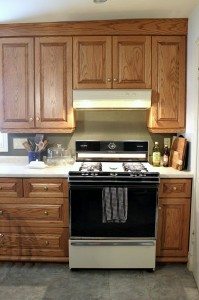 I am going to tile just behind the stove and just above the sink because that’s all we can fit into the budget, but I think the color block technique would work well in the surrounding areas. Thanks! Great color. 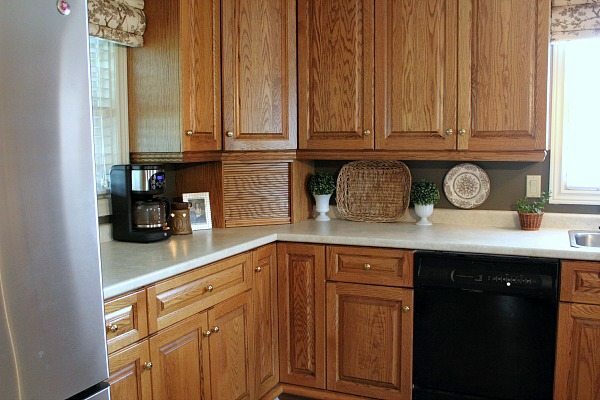 You have really nice cabinets too. Some of the best ideas are so simple. Except I need people like you to think of them! : ) Thank you for sharing this! Wow! What a difference a little paint makes! It looks great. Now I’m wondering if it’s possible to paint tile. 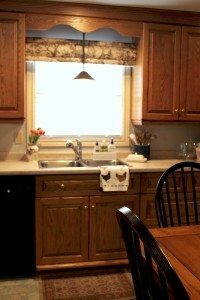 I’ve got a tile backsplash that looks outdated, and would love to make a change. I think your kitchen looks very nice, and after the paint job even nicer, the only thing I would do is just purchase matching appliances, I like your countertop as well, it makes the color pop even more! Great job! Love the back splash but also wanted to ask…how many Mothers-in-law do you have? LOL! I’m also now following you her and on Pinterest. 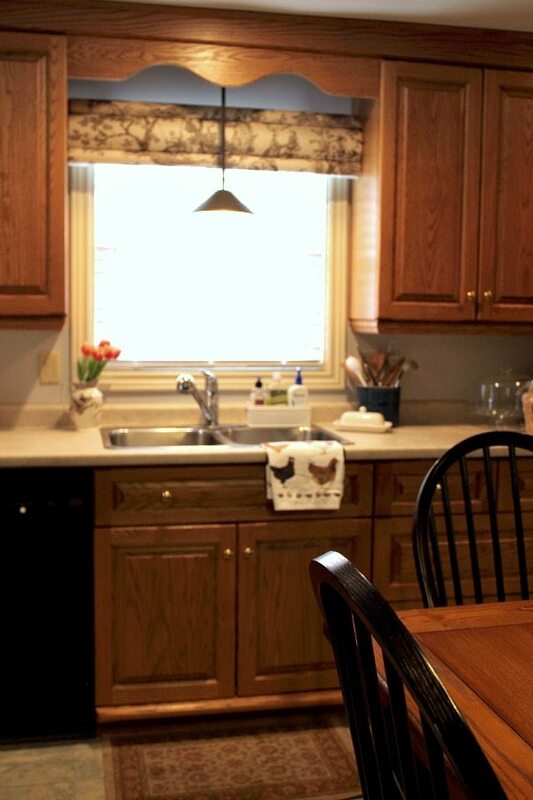 We are going to paint our cabinets white this winter, so perhaps if we cannot do a subway tile I will do that. I could paint it with the living/dining rooms Zeppelin! What a great idea, thanks! how many mother in laws do you have?